Tony Buzan was an author and educational consultant. He was a proponent of the techniques of Mind Mapping and mental literacy. He worked with: corporate entities and businesses all over the world; academics; Olympic athletes; children of all ages; governments; and high profile individuals, in teaching them how to maximize the use of their brain power. Buzan was born in London, was an alumnus of Kitsilano Secondary School, and received double honors in psychology, English, mathematics and the General Sciences from the University of British Columbia in 1964. He is probably best known for his book, Use Your Head, his promotion of mnemonic systems and his Mind Mapping techniques. 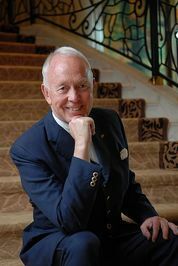 He launched his own software program to support mind mapping calle Tony Buzan was an author and educational consultant. He was a proponent of the techniques of Mind Mapping and mental literacy. He worked with: corporate entities and businesses all over the world; academics; Olympic athletes; children of all ages; governments; and high profile individuals, in teaching them how to maximize the use of their brain power. Buzan was born in London, was an alumnus of Kitsilano Secondary School, and received double honors in psychology, English, mathematics and the General Sciences from the University of British Columbia in 1964. He is probably best known for his book, Use Your Head, his promotion of mnemonic systems and his Mind Mapping techniques. He launched his own software program to support mind mapping called iMindMap in December 2006. His website, Buzan World, cites trademarks on the phrase 'Mind Maps' which he has registered in many countries. Following his 1970s series for the BBC, many of his ideas have been set into his series of five books: Use Your Memory, Master Your Memory, Use Your Head, The Speed Reading Book and The Mind Map Book. He authored or co-authored over 100 books. Most of his teaching generally divided up into: general awareness of the extensive capabilities and capacities of the brain and its functions, memory skills, reading skills, Mind Map note-taking and note-making, creativity, and how brain function can be improved over time into old age. Buzan developed Mind Mapping whilst at university, out of the frustration that traditional notes took up so much time to create and review. He has argued that Mind Maps are an efficient way to take notes from lectures or books. His brother Barry Buzan, who co-wrote The Mind Map Book, suggested the technique could also be used to capture notes from one's own creative ideas and is useful in business.